Sidney H. Hatch was one of the greatest distance runners to come from our communities. He was born in River Forest and attended Oak Park & River Forest High School where he ran track. In 1906 he set an unofficial world record in 100-mile run, and was a 2nd place finisher in the 1917 Boston Marathon. 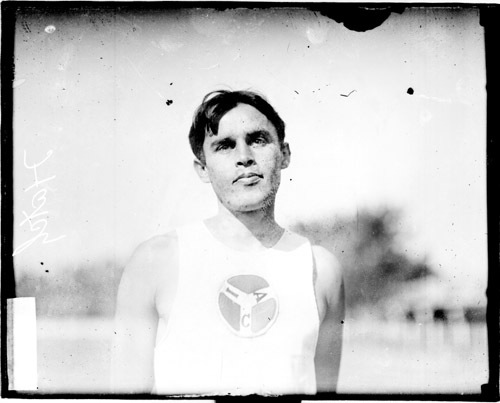 At the 1904 St. Louis Olympic Games, Hatch was a silver medalist in the men's four mile team, and also competed in the marathon. He ran in the 1908 London Olympic marathon as well. Hatch was chosen for the 1912 Olympic team for the games that were held in Stockholm, Sweden, but he did not go. In addition to his running prowess, Hatch was awarded the Croix de Guerre by the French government for his heroism in combat during World War I.